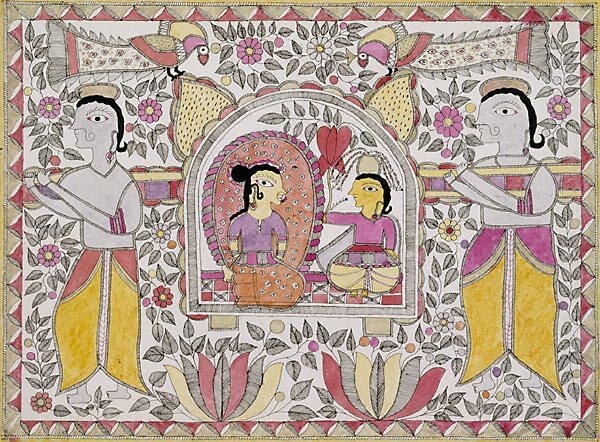 For centuries, Hindu women around adhubani, in the Mithila region of Bihar, India, have decorated the walls of their village homes with vivid paintings to ward off evil, mark festivals, and commemorate passage rites. This longstanding tradition, however, remained largely unknown to outsiders until the late 1960s, when a severe drought, lasting up to two years, had a devastating impact on the region’s predominantly agrarian society. To provide the community with a non-agriculture-based income, the All India Handicrafts Board then urged the women to create their paintings on paper for commercial purposes and introduced the world to Madhubani or Mithila painting. This painting depicts a bride and bridegroom being transported to the bride's house in a palanquin, a type of enclosed chair. The Asian Collections Art Gallery of New South Wales , 'Contemporary Painting in Urban and Village India', Sydney, 2003, 53 (colour illus. ).